Once you installed, both Visual Studio and VS Code will start displaying AI-assisted IntelliSense by showing recommended completion items for your code context at the top of the completions list. For example in the following screenshot, it is displaying LoadHtml method of HtmlDocument class from HtmlAgilityPack package. With the preview release, IntelliCode will display recommendations based on your code, works only on C#. You can have IntelliCode learn patterns from your code, so it can make recommendations on code that isn’t in the open source domain, such as methods on your own utility classes or domain specific library calls. We keep the trained models secured, so only you and those who have been given your model’s sharing link can access them–so your model and what it’s learned about your code stay private to you. 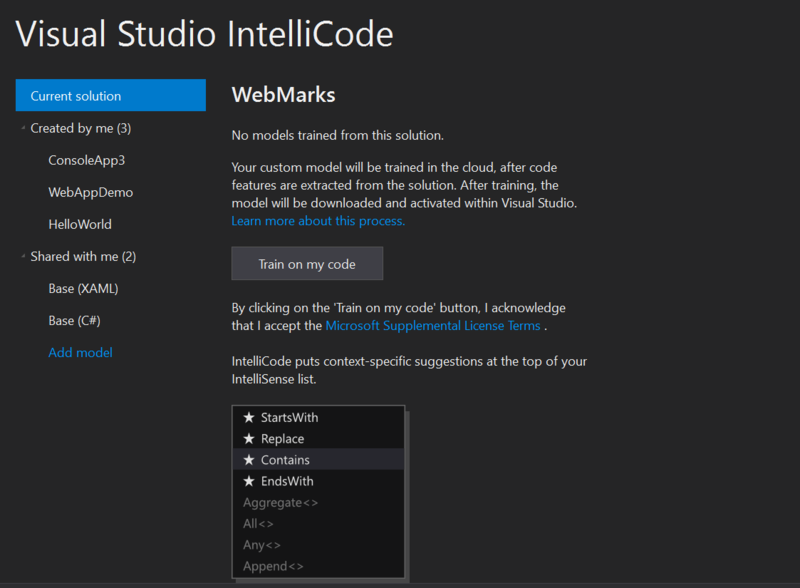 When you open a project in Visual Studio, IntelliCode will prompt to train the model. And clicking on Try it now will display a screen like this. You can take open this screen from View >Other Windows >IntelliCode menu item. You can train IntelliCode by clicking on the Train on my code button, which will learn patterns from your code to make recommendations for things. Once the training is completed, it will show details about the model, option to share model with your co workers, delete model option and ability to retrain the model. Share model option gives a URL, and this you can use with Add model option. I started using Visual Studio IntelliCode. Are you using it? Did you faced any issues? Let me know. Here are some resources which helps you to get more details about Visual Studio IntelliCode.